Justin McNulty aka Kutmah has made a name for himself as a talented underground artist & DJ. He became a member of LA’s dublab collective and then in 2004 he founded the celebrated club night ‘Sketchbook’ which forged fundamental roots of the now-infamous LA beat scene. As an associate of Flying Lotus’s Brainfeeder collective, his mixes from his time spent on the West Coast are legendary amongst those that know, and he’s also released several of his own original records – even though he’s predominantly a DJ, with foundations in hip-hop and a record collection that spans far beyond the genre. 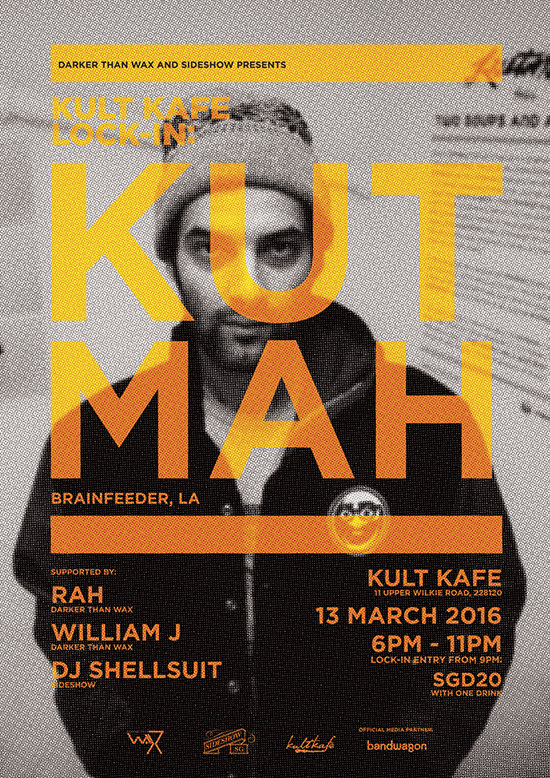 Since his time in LA, Kutmah has relocated back to England and currently resides in London. He now holds down a show on NTS Radio, and has furthered his reputation as one of the most fearless selectors around (as well as a visual artist; his work was exhibited in the capital last year). Earlier this year BBC DJ Gilles Peterson invited him to curate the second CD in Brownswood’s (Peterson’s Label) Worldwide Family series. Kutmah is now at it again and touring across the world, he’s been playing shows with Saul Williams, The Gaslamp Killer, Flying Lotus, Gonjasufi, Dabrye and many more. The night will be supported by RAH and WilliamJ of Darker Than Wax, and Shellsuit of Sideshow. Visuals by Race (O$P$).